YES, I WANT TO APPLY FOR THE RETREAT! HOW TO GROW A SUCCESSFUL COACHING BUSINESS? - UNSURE how to start your coaching business or which direction to take. "I need clarity." - SHORT OF TIME, energy and focus to get your business off the ground. "I have a family to support." - DOUBTING how to put yourself 'out there' and who would want to listen to you. "I fear rejection." - UNCERTAIN how to define your niche and hone your ideas to make sense. "I'm confused." - UNSURE if you have the capability to set up the technical aspects. "I don't know how." - FRUSTRATED you're not getting the results you desire. "I've tried different things before and failed." - Start your SUCCESSFUL coaching business and get paying clients QUICKLY & EASILY. - Follow a STRUCTURED process, so that you can RELAX and move forward with PEACE OF MIND. - Get a PROVEN PLAN, TOOLS and STRATEGIES that show you exactly WHAT TO DO step-by-step. - Know exactly how to FIND THE RIGHT CLIENTS in ways that feel AUTHENTIC AND TRUE to you. - Have a better UNDERSTANDING of the TECHNICAL aspects and know who to go to for SUPPORT. - Increase your CONFIDENCE with EXPERT GUIDANCE, surrounded by inspiring, likeminded people. - GET AWAY from the distractions of everyday life in an environment of TRANQUILITY & BLISS. - FOCUS on all the tools and strategies you need to FIND YOUR STEPS and business vision. - PROFESSIONAL, WARM & GENUINE, world-class teaching. - Get INSPIRATION from a group of LIKEMINDED PEOPLE and share never-forget memories. - Wake up every day feeling EXCITED, ENERGISED and CONFIDENT about what you have to offer. - KNOW EXACTLY how to build a successful coaching business online. > 8 Workshops to find your voice, clarify your ideas and create an action plan to take your coaching business to the next level. > Your own private en-suite room in our secluded luxury villa in surroundings of tranquility and bliss. > Personal 1-on-1 coaching with business coach, Carl Brooks. > Inner work with "me-time" coach, JJ van Zon. > Delicious organic, Italian cuisine and local wines. > Refreshing & energising, yoga & meditation. > 3 Months Implementation mentorship after the retreat with Carl Brooks. This retreat is for a select few big-hearted, hard working coaches & entrepreneurs who are ready to step out of their comfort zone and grow. Whether you’re an experienced coach or you’re just starting out and want clarity on the direction. We’ve got you covered. All you need is your willingness to trust and learn new skills to create a business that reflects your heart, your value and the impact you want to make. 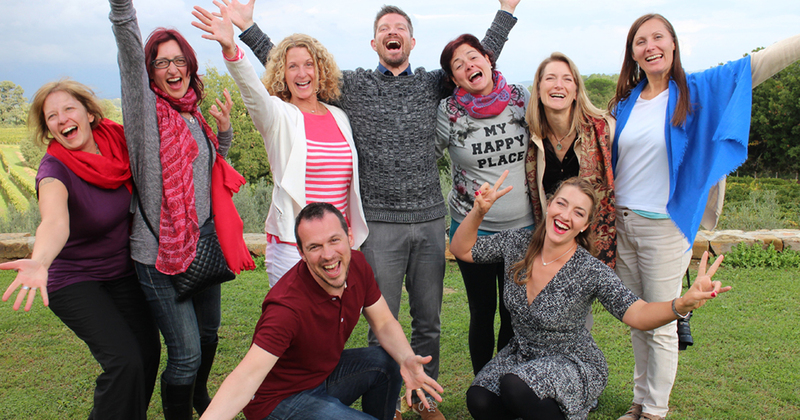 Are you ready for this fun, once in a lifetime, Wealthy Coach Retreat ™ adventure at one of the most beautiful places in the world Tuscany, Italy? Read on to learn more about our location and program, and if it’s the right fit, enter your name and email address and we will send you a calendar where you can choose and schedule a call with me. I can’t wait to see you in breathtaking Tuscany, Italy! ARE YOU READY TO COMMIT TO YOUR DREAM? YES, I WANT TO APPLY! The Diacceroni Villa is a brand new luxurious house situated in an excellent location, where you can experience both culture and nature up close. It is one of five houses that comprise Agriturismo Diacceroni, and is situated a pleasant 5 minute walk from the main farm house which is called Diacceroni, where one will find the restaurant with high class cuisine, friendly staff and the riding stables. Diacceroni farm is located in an excellent position surrounded by lush Tuscan fields on an estate of 250 hectares. When you want to see Tuscany, this is the place to experience it. You'll feel like your standing in a painting. 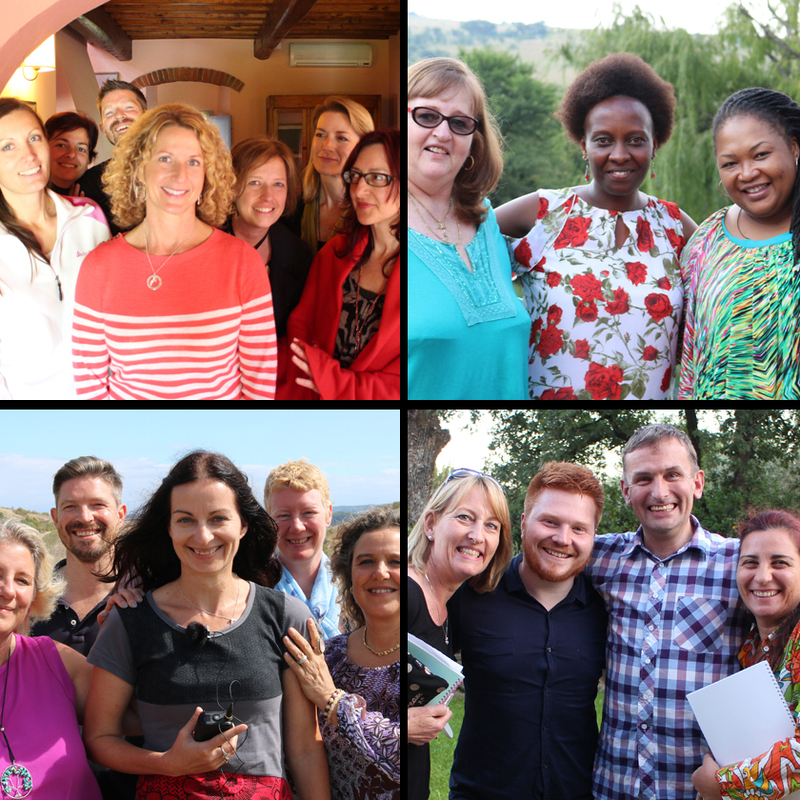 Diacceroni is extra special for us, because this is where our idea of the Wealthy Coach Retreat developed into the success it is right now. We were invited to a Tuscan Wedding by dear friends of ours and as we went we were still looking to find a way to work together. And like magic the idea came over us. Diacceroni is magical. Here is where you'll find the calmness and the inspiration to create your awesome business. The staff of Agriturismo Diacceroni makes you feel welcome and appreciated. They got that extra mile to serve you efficiently and always with a smile. Often during diner, you'll be entertained by Italian tenors, while eating delicious pizza and pasta and drinking fine local wines. You can also purchase the estate organic wines, jams and other farm produce, at the reception. Diacceroni farm is an ideal base in the heart of Tuscany, not far from Florence, Pisa, Lucca, San Gimignano, Siena … and the sea. The farm is just a few kilometers from the historic centre of the etruscan and medieval town of Volterra. When you have the means go and explore the rest of Tuscany before or after the retreat. I promise you that this adventure will be a treasure always. 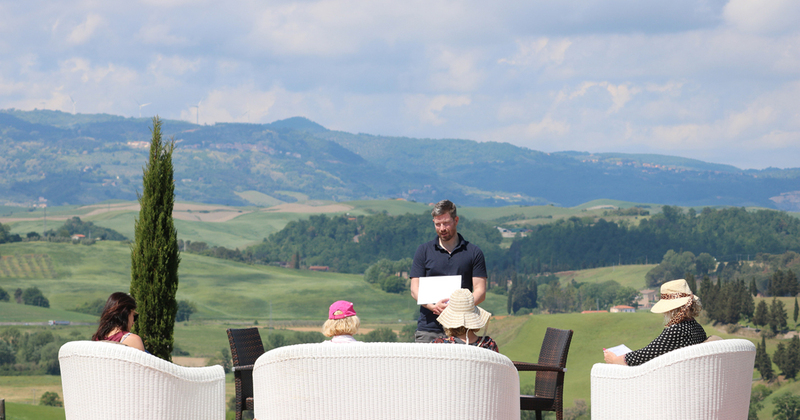 So when you're in need of an experience, knowledge to start a business and a magical surrounding, escape to the tranquility and bliss that awaits you in Tuscany’s premiere eco retreat. Experience the splendor of authentic Tuscany in the beautifully restored historic buildings set in an inspiring, rural landscape. Make yourself at home and enjoy the beauty and comfort of this Tuscany retreat in the foothills of the world-renowned renaissance towns of Florence, Pisa and Siena. Carl Brooks is an international business growth coach, speaker, founder of the group Profitable Coaching, and author of the book “How To Turn Your Coaching Dream Into a Money Making Machine. Carl has 20 years experience in marketing, communication and coaching, creating more than $800 million in sales per year. Carl’s life threatening wake up call a few years ago dramatically altered his life’s direction and calling. He woke up one morning with the left side of his body paralyzed. Doctors found an abscess the size of a golf ball in his brain that was crushing his nervous system. Thankfully with neurosurgery it was treatable, and Carl made a FULL recovery! This life altering experience catapulted Carl into a new life as a thought leader, business mentor and international coach. 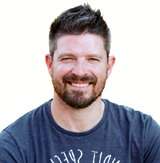 Carl now dedicates his life’s work to empowering coaches and business owners around the world to master a high-performance mindset, build profitable business and become thought leaders in their field. 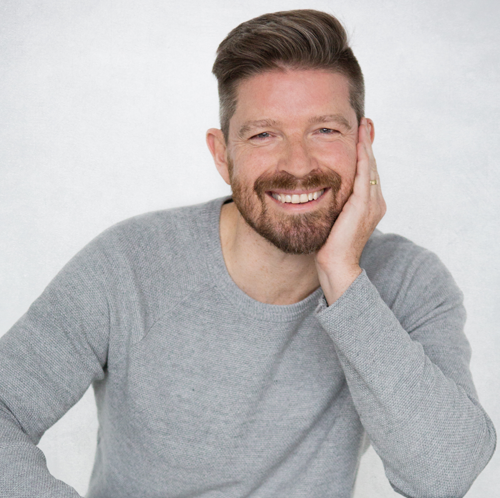 JJ van Zon is a mindfulness coach and expert on effective decision-making. With 20 years experience as a professional dancer and a yoga & meditation mentor, he is a cutting-edge leader in body, mind & soul awareness. His talent to empower and influence was quickly spotted by an international coffee brand, which he helped to generate over a million dollars in sales. JJ has since developed a yoga & meditation program to help you shake off uncertainty and embrace your full potential as a coach and entrepreneur. 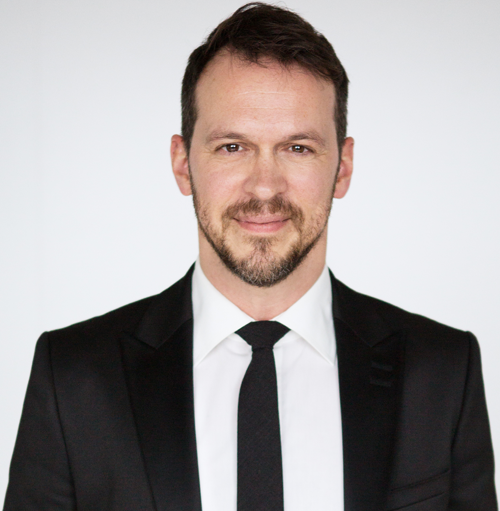 His warm and theatrical, teaching style, instills clarity and the confidence to overcome any limiting beliefs that hold you back. And he'll show you strategies to creating that magnetic energy that clients flock to. JJ is also the production director of the retreat. He will care for you and you'll feel welcome, safe and open to discover yourself completely. 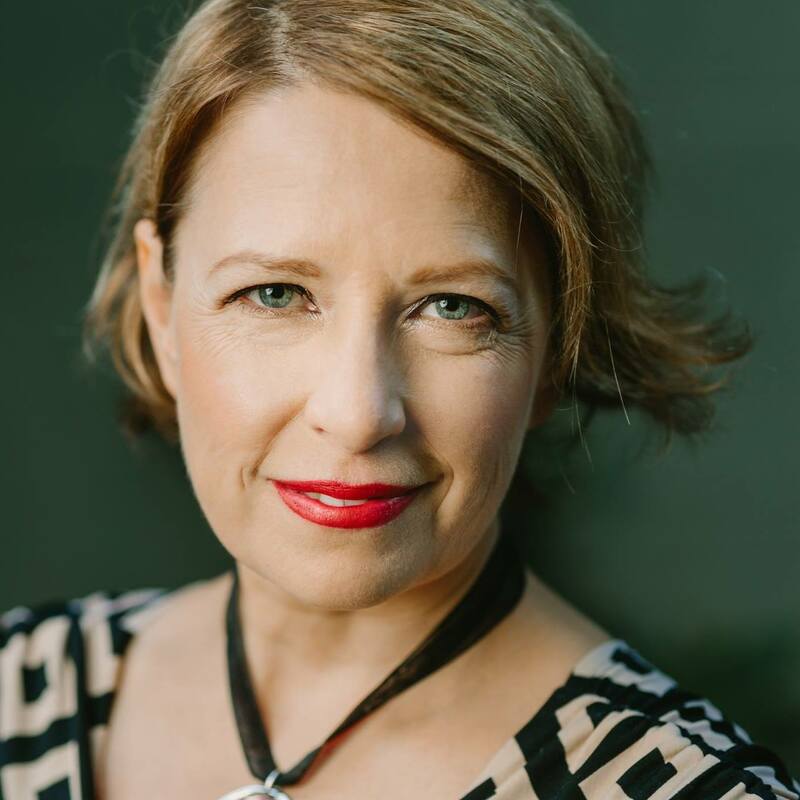 JJ likes to create a personalised healthy business mindset with body, mind and spirit using the main chakras as the portal for supercharge energy. ARE YOU CURIOUS ABOUT THE TRAINING? From Pisa airport you can easily rent a car or take a taxi to Diacceroni Farm (40 min). We can discuss your travel options when you apply. After arrival at Diacceroni farm and check in, you'll experience a special introduction to ground yourself for the intense days to come. After we'll enjoy a welcome dinner together with Italian music hosted by the staff of charming Massimiliano (the estate director). Today we start to get clear on the vision for your business and all the steps to make it happen. You'll come away with a clear blueprint to reach your income goals and make the impact you desire. And you get clarity on your business model, your ideal customer and your offerings that your customers will love. Successful coaches don’t just satisfy needs; they create offerings that fulfil deep wants, desires, beliefs and world views. 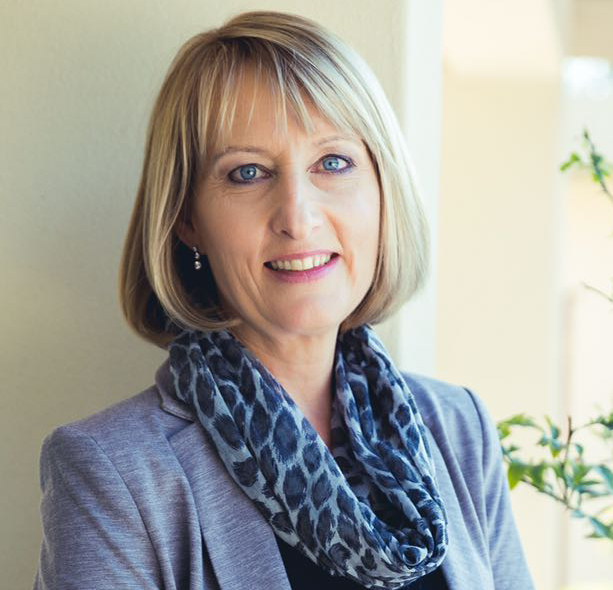 It’s all about emotion, creativity and connecting with your clients so that they feel acknowledged and supported in a way that makes sense for them to trust doing business with you. Today Carl shows you how to translate the wisdom into great offerings, copy, and sales pages that deeply connects with your audience in a way that makes sense for them to buy. When it comes to understanding marketing and growing your business online, it’s Carl’s personal mission to be your trusted advisor and help you understand how to generate big results. Imagine how it would feel to have a marketing plan that was generating leads and revenue for you every single day. And, imagine waking up in the morning in the knowledge that your business is working for you 24/7 - on automatic. That's what modern marketing can do for your online business and it starts with simple tools and heart-centered communication, to build a tribe of loyal fans who love your brand. Success in business is 80% psychology and 20% mechanics. It takes psychology strength and outstanding physiology to overcome the limiting beliefs that hold us back from achieving our full potential. As coaches and entrepreneurs, we must strive to uncover all the layers of doubt and uncertainty and replace them with a new spirit & value driven success mindset to inform all our business decisions and maintain the discipline to get the job done. Starting an online business with good intentions isn’t enough to establish yourself in your field. To get massive results you must communicate your value and position yourself as an expert and thought leader. Positioning means showcasing what makes you unique. It also means basing your rates on the value you deliver to your customers and your problem solving skills. People will not say yes to your offerings unless you show your value. Today Carl shows you how. Here, you put everything you learned together into a firm action plan that you can implement upon your return home. You’ll get constructive feedback from your support group so that you can fine tune and optimise your plan. Carl will set you up with an accountability plan to help you schedule and deliver your goals on time. After our last class, we'll enjoy drinks together, where we'll share our experiences, have fun and then say our goodbyes with our new close friends for now. 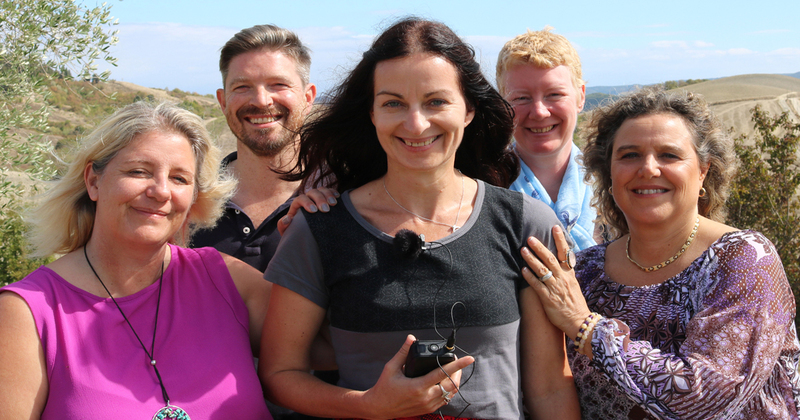 Bon voyage back home, full of inspiration and a blueprint for your thriving coaching business. ​After mid-morning check-out, we enjoy our last Italian breakfast together. We will close the retreat with supportive notes valuable for you to keep the magic going at home. There's lots of fun sharing and then our goodbyes for now, with your close news friends. Bon voyage back home, full of inspiration to build a thriving coaching business you love. DO YOU WANT FINANCIAL AND CREATIVE FREEDOM? Carl Brooks is the real deal. Truly coming from the heart and caring for his coaching clients and program participants, while also knowing and teaching that coaching must be a profitable business. 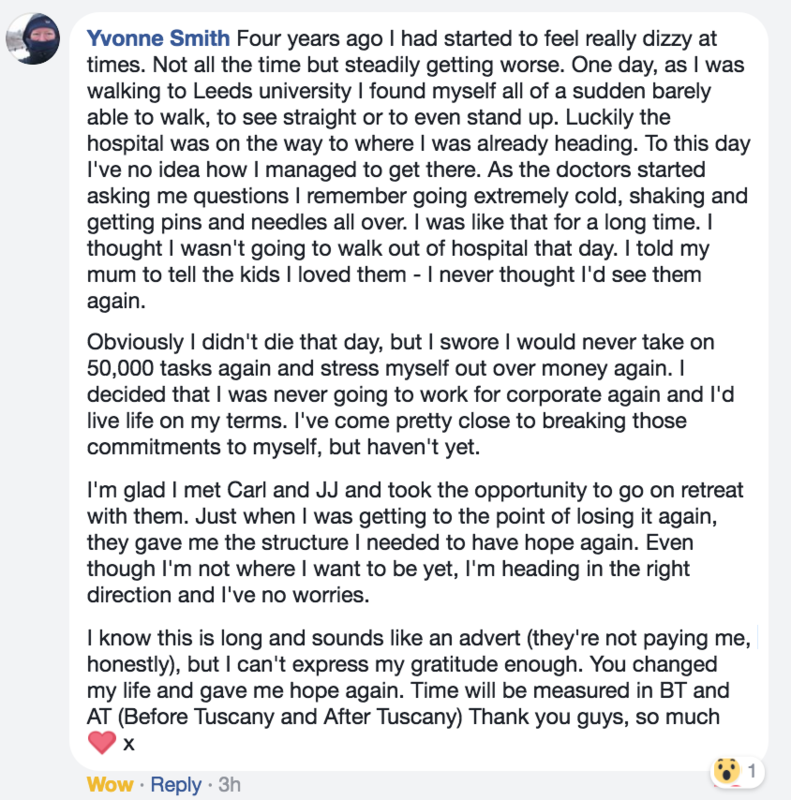 Carl's own journey of overcoming a life threatening illness, leaving his corporate job to launch his successful coaching business is inspirational to all who wish to Step into the Spotlight and follow their own dreams. ~ Vanessa Talbot, Profile Building Alchemist for Coaches. Carl & JJ, I just wanted to express my gratitude to you for your teachings, inspiration, guidance and unwavering support. Thanks to all the above my first workshop on Saturday went off so well. It was a great success and I loved every minute of it. It is my intention to make this the first of many more. Attending the retreat in Tuscany has been a turning point in my life. I am extremely grateful for the opportunity you gave. Carl Brooks, I want to thank you for being a serendipitous saviour in this beautiful world. You came along at the right time to be a catalyst for a big shift in my life. The experience was life altering. You've provided essential tools for creating a systematic business and an opportunity to open my self to vision. You are so refined and at the same time so real. Thank you for finding a way to integrate your fantastic mind with your essential heart. Thank you for paying it forward and generously bringing me on board for the Tuscany experience. You are a master. I know that when you get back home you're going to have questions and need a helping hand to implement all that you've learned at the retreat. I also know and that's the main reason I'm offering you this 3 months bonus support is because of the daily distractions at home. It's very easy to get back into your normal routine, helping, pleasing others and spending your time not concentrating on your clear blueprint for your business. The support system will be crucial. It will keep you focused and determined, so you'll make the steps in the direction of a successful business, so you can serve others with your unique gifts. That's why I'm gifting you 3 months of additional support after the retreat to help you grow your business FAST. 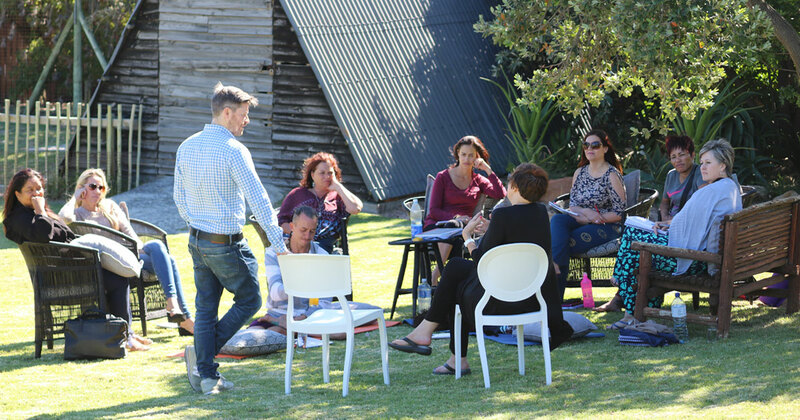 You'll be part of a group with the like minded business owners you met at the retreat. This support system is really priceless. I met Carl in October 2015 in Tuscany at his retreat. In just one year, I have experienced incredible changes in my business, my personal growth, and my relationships. I made progress, but the most vivid changes I have experienced in my business have been since I hired Carl as my 1:1 business coach beginning in May 2016. 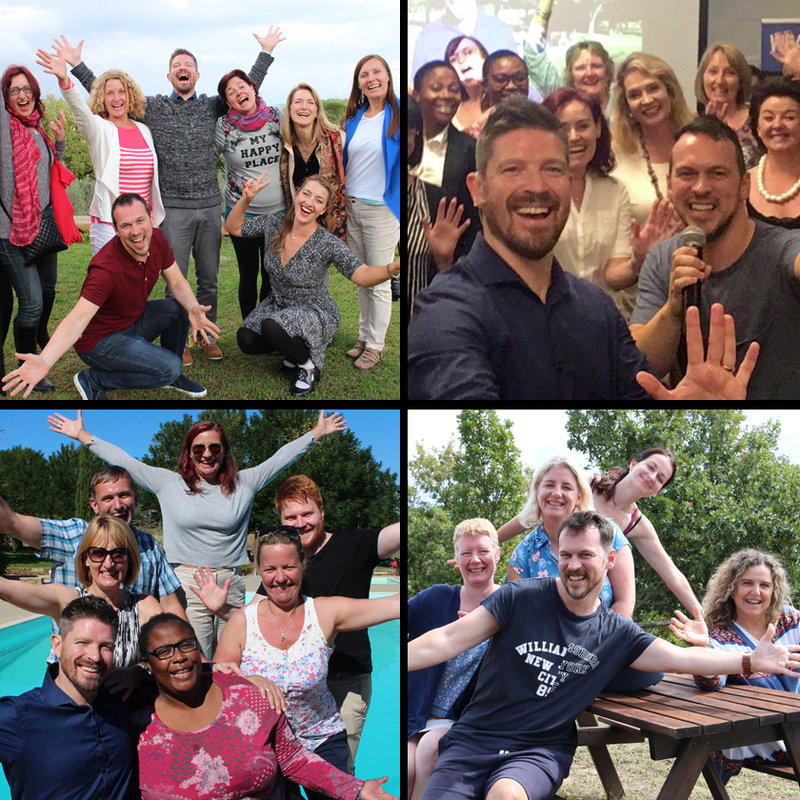 Carl’s compassionate and encouraging, yet realistic, support has enabled me to grow from financially struggling coach and music teacher, to growing a coaching business that is on the cusp of an explosion. With his support, I have expanded my social media engagement, I have created my first online training program, and I am about to launch my own first retreat this December. >Hi Carl, I signed two business coaching clients for four weeks yesterday! My second appointment with them and I am so excited. Also signed a life coaching client on Saturday, also for four weeks! You have transformed my life, vision and business. I love you to the sky! Thank you for everything. Right from the first time I met Carl, I was struck by his enormous positive attitude. Just by his presence and energy, he let me feel that I too, can fulfil my potential! He inspires me every time. He's one of those people that are beautiful because he has known suffering & struggle, and he has found a positive way out of it. That makes him truly inspirational! HOLD ON, READ THIS FIRST! If you are expecting “overnight results” with “very little effort/work involved” this, friend, is not for you. This is not a get rich scheme. I give you the EXACT blueprint and show you what to do, but only you can actually do it and yes, it involves getting in the trenches and doing work (that being said, I can take tons of time off your learning curve which is another benefit of the course). If you have a negative attitude, please don’t apply for the Wealthy Coach Retreat . Life is too short and we probably won’t get along. Also, if you “know all of this already ” this might not be for you. My guess is I will be sharing with you in the retreat things you already know AND things you probably don’t do. But, this is the USP, it is all put together as a system for you to go at it step-by-step. If you come in with the attitude that you know everything or are looking for some kind of magic wand, this isn’t for you. Anyone who wants to make a difference in the world with their dream business. Maximum 4 likeminded people (mostly women). The Climate in tuscany is generally very mild, May has sunny days and some rainy days. Just dress in layers to prepare yourself for the shift between daytime and evening. for the average daily maximum temperature is between 23C/76F and 12C/54F. In general, we recommend you bring smart-casual clothing, something light for yoga and mediation, as well as something warm for the cooler parts of the day. If you would like to use the swimming pool, please bring swimwear. What Is The Cost And Return On Investment? 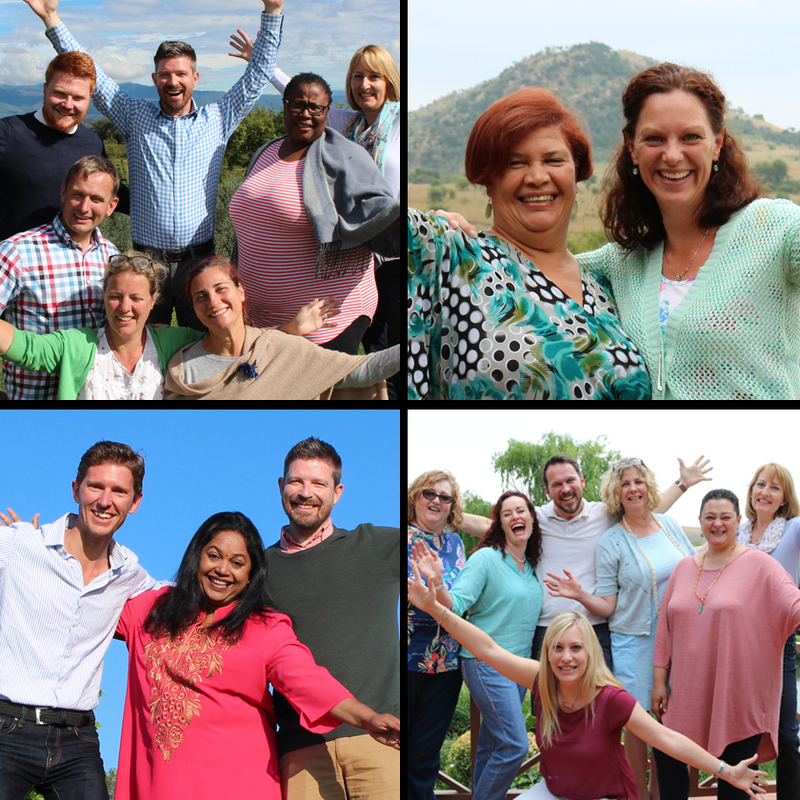 Our world-class, business training is specifically designed to help you create a successful business and make money, for the rest of your life, with your gift to change lives. The golden rule I share with my students is to first identify which life & business goals you'd love to achieve and the cost of staying on your present path if nothing changes. We do this on a call together, which you set up when you apply. During the call, if it appears that our training and your goals are a good fit, I'll share more details about the retreat. This is when we discuss the investment and easy payment plans. YES, I WANT TO APPLY NOW! There are limited spaces on this retreat and they can fill up quickly. This could be the moment that takes your business to the next level. Take that dream of yours and make it reality. Be in the here & now and decide about your future. 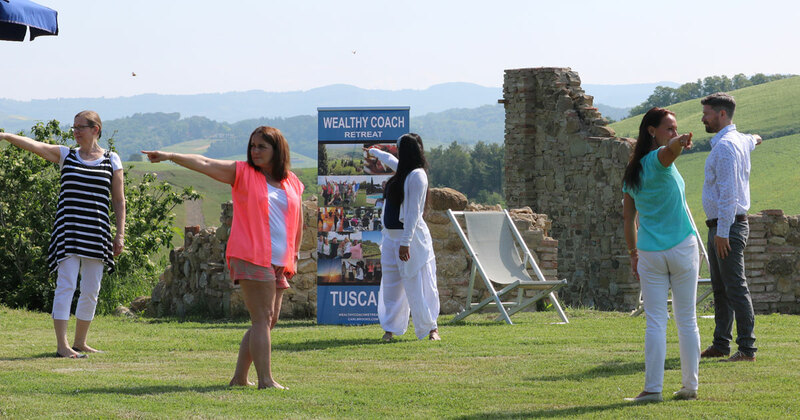 Don’t miss this once in a life-time, Wealthy Coach Retreat ™ Tuscany adventure and apply now. WHAT DREAM WILL YOU CREATE? This is the once in a lifetime opportunity that could change everything for you. 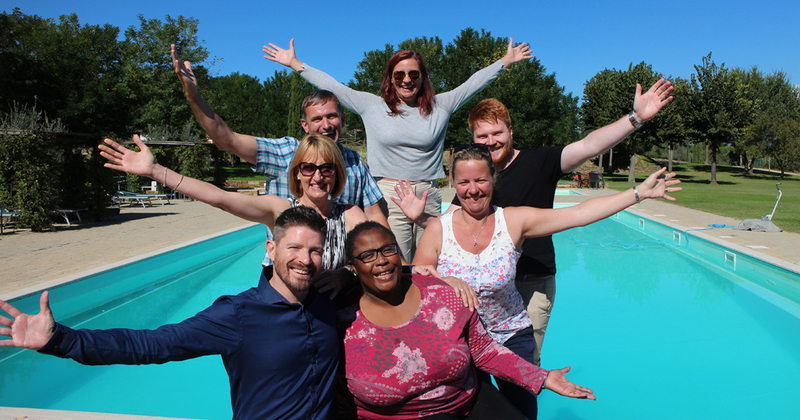 This is your chance to step away from the confusion and frustration of going it alone and dive deep into your business, your mission, your marketing and your biggest asset YOU in one of the most beautiful and inspiring places in the world. I believe that you’ve come to this site seeking inspiration and answers. What I know for sure is that everyone has the power to change inside them. Many of us are searching outside of us, but it's actually inside of us. Tap into that power and dare to take the step. Apply and invest in yourself. Consider this as your call to lift you to the next chapter in your life! You owe it to yourself to get everything out of life that's possible! P.S. 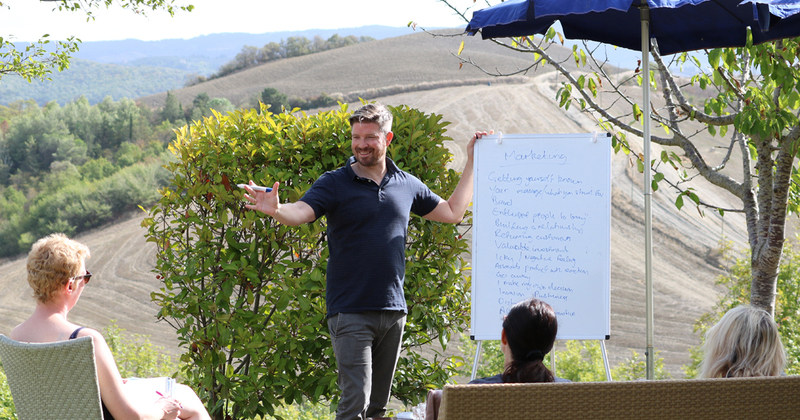 The results you will get from this Wealthy Coach Retreat will be directly related to your talent, skill and ability to implement what you learn. While we cannot guarantee results, we can guarantee your 100% satisfaction with the training at this retreat.